Lately I have been reveling in my daughters’ childhoods. I don’t know what it is, but I’m constantly feeling this overwhelming feeling of gratitude for every minute I have with them. I am loving watching them learn and grow…and there is a lot of learning and growing going on in our home these days. I don’t know why they’ve seemed so cute to me lately. When they talk, play, pretend, sing, smudge chocolate on their faces…it melts my heart. The other day Anna was sitting at the kitchen table with us. I think we were reading books or something, but I do know we were not eating at the time. 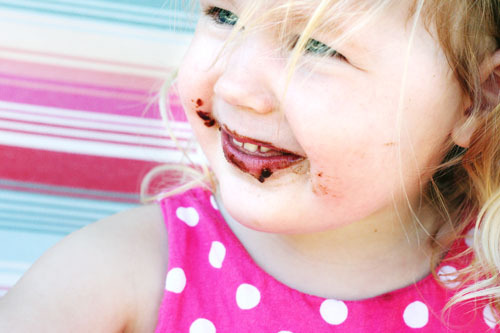 I looked up at her while she was chattering away…and her face was covered in chocolate. It was so funny. But it was also so endearing, this little two-year-old just talking away, completely oblivious to the mess that was her face. I think maybe the strong feelings of “They’re so cute!” may be stemming from the fact that time is really starting to speed up. We all know that the older you get, the faster time flies. When we took the girls to see Toy Story 3 this summer, I was bawling through the last 5 minutes of the movie. You know, the scary mom cry. I just knew that in the blink of an eye, my own children would be heading off to college, leaving behind their own tokens of a beautiful childhood, heading off to create their own lives, and raise their own children. I’m trying with all my might to enjoy every second leading to that time. And I know it will be a beautiful time, a new adventure. I just wish the journey wasn’t so fast. Knuffle Bunny Free arrived in the mail two days ago. The girls and I were super excited to read of Trixie and Knuffle Bunny’s latest hijinx. We were happily enjoying the story…and then we got to the end. Does Mo Willems know what he’s doing to adults everywhere? It would be mean if it wasn’t so sweet. As we neared the conclusion of the story, I was trying desperately to read with a normal voice, but the scary mom cry got in the way. I finally had to stop and explain to the girls that it was a “Happy Cry.” And THEN there was an epilogue that took everything to a Steel Magnolias level. I could seriously barely get a word out. The killer part of all this was that Trixie isn’t heading off to college. She’s right around Cate’s age. When the story was done, Anna was upset that Trixie had given Knuffle Bunny away. She couldn’t understand it. And Cate explained to her that it was a good thing. Cate got it. Which just about did me in. Looking at my two girls, I could see right in front me the different stages that they are in and just how fast they are both powering through those stages. Growing up is bittersweet. Without the bitter, we wouldn’t appreciate the sweet. But I’m still going to focus as much as I can on that sweetness. Especially if it’s smeared all over a cute little face. Last week when I made the Pesto Tortellini Soup I had on my menu, I ended up with 7 ounces minus 1/4 cup of pesto left over. The next night we had Easy Peasy Bean Tacos, which resulted in a half a container of leftover grape tomatoes. The next night (are you liking this painful play-by-play?) I swung by the store on the way home from a playdate and saw a $2 package of fresh fettuccine that inspired me. I grabbed a half pint of cream, a package of sliced mushrooms and went home to throw dinner together as quickly as possible. The result was a simple and fast recipe that was molto delicioso. The best part? My girls ate ALL of their dinner and then some. And I have another meatless recipe to add to the arsenal. Quick, easy, and super yummy! Prepare pasta according to package directions. Drain and drizzle with a bit of butter or olive oil to prevent sticking. While waiting for water to boil for the pasta, start working on the other stuff. 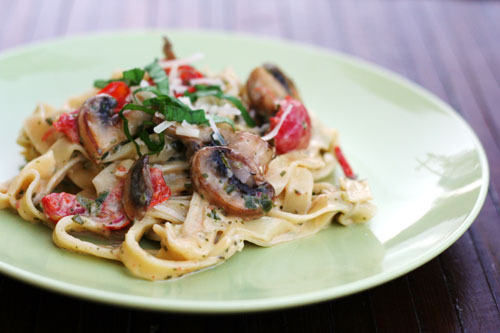 Sauté the mushrooms in a tablespoon or two of olive oil until softened. Add garlic and tomatoes and sauté a few minutes more. Add cream, pesto sauce and salt; simmer to reduce until slightly thickened, about 5 minutes. Add parmesan cheese and stir until melted. Pour sauce over pasta and serve, sprinkled with fresh grated parmesan cheese and fresh chopped basil if you have it. A few things I think would be good to add, but I haven’t actually tried yet: a shallot sautéed with the mushrooms, spinach, or white beans. Another birthday has come and gone…and with it delicious cake. 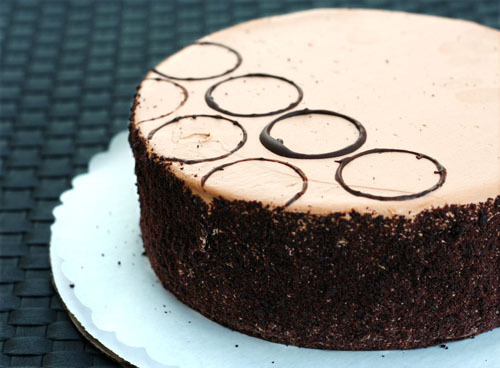 Nate picked up this chocolate mousse cake from Mayfield Bakery for my big day yesterday. Perfectly moist chocolate cake layered with bittersweet chocolate mousse…and a few raspberries mixed in here and there, but not overpowering in flavor. Mmmmmm. We ended the day with a babysitter coming over so Nate and I could go to a movie. All day people asked, “What are you going to do for your birthday?” And I would respond, “Nate and I are going to go see The Town.” EVERY time they said, “Oh, fun! What are you going to do in the city?” That movie name is confusing, people. The movie was a good shoot-em-up-and-end-up-rooting-for-the-bad-guy kind of film and had me thinking in a Boston accent for a few hours. The North End chase scene was awesome. Enough about me, time to get to business! – Going with my girls to a Muppets Kitchen event, cooking with those crazy puppets. Should be fun! Now it’s your turn – share those menus, fancy or not! And have a wonderful week! There are three bottles in my kitchen that I love. Every time I use them I’m grateful for them. You must be dying to know what they are…okay, I’ll tell you. This is the best maple syrup bottle ever. There’s a lip around the edge that catches the dribbling syrup, and then a hole in that lip for the syrup to drip back down into the bottle. Why aren’t ALL bottles made like this? Seriously, it’s genius. I buy my real maple syrup wherever I find it lease expensive (most often TJ’s or Costco) and then just keep reusing this bottle. I’ve never met a honey container I liked. EVER. Until this one. 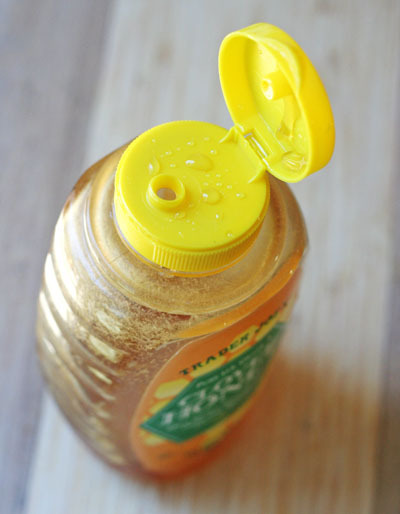 The plastic bottle is actually pliable enough to squeeze, so you don’t have to stand there all day waiting for the viscous honey to drip down. The cap gets a little messy like most dispensers, but it works well (I think better than most). I buy my honey at Costco and pour it into this bottle. 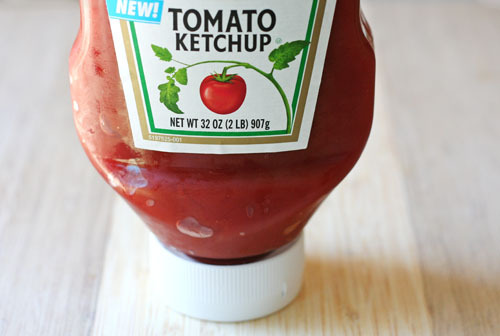 I love upside down ketchup bottles. I know Heinz makes them. Maybe other companies do too? Regardless, the idea is a revelation. You don’t have to wait for the thick ketchup to work it’s way down, and you don’t get that water squirting out first, turning your hot dog bun into bread pudding. Love it. I’ve officially hit COOL status…I’ve got a stand-alone freezer. What is that white box standing in my garage? Oooo…it has a door on top. What could be in there? 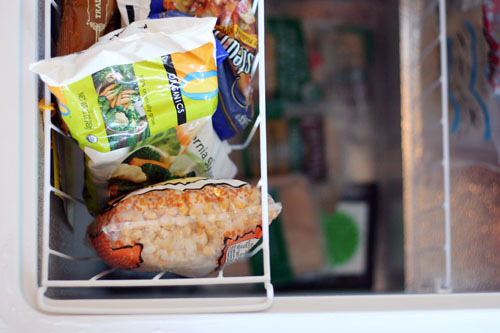 Frozen food? Say it ain’t so! Yup, we went to Sears and bought a stand-alone freezer last weekend. And I couldn’t be happier. We all know I like to freeze stuff. Cookie dough, vegetables, wine, jam…and this article about freezing food by Mark Bittman might be one of my most favorite New York Times articles ever. So the fact that I now actually have room to freeze all this stuff makes me feel all warm and fuzzy inside. I know, ironic. 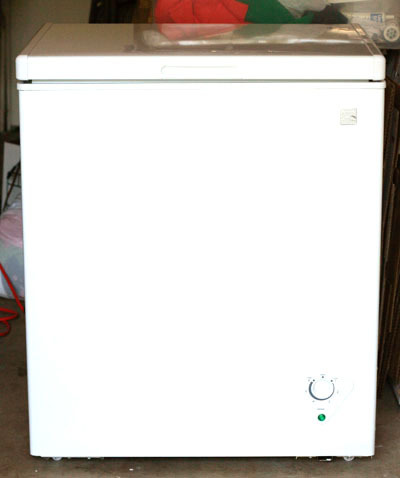 Now that I have 5 cubic feet to freeze things, what should I be freezing? Obviously I already have oodles of ideas. And I’m even thinking of going in on a cow next year. Yes, a cow. A local friend of mine purchased a cow with some other friends and when it was butchered, they split the cuts of meat. Now I can actually do something crazy like that! You know how much I love hearing from you. 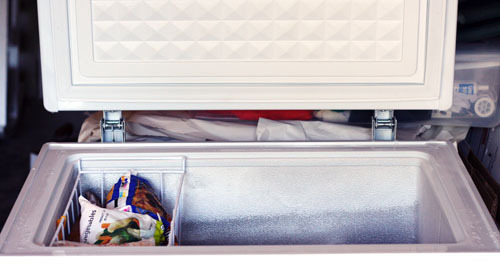 Please share your favorite foods and tips for freezing! Menlo Park Week Giveaways – Winners Announced! Today’s the big day…time to announce all the winners from the Menlo Park Week giveaways! I kept random.org busy today! Alyssa, who said: this basket looks fabulous! Congratulations to all the winners! Thank you to everyone who entered! And thank you to all our wonderful businesses who participated! Menlo Park Week was oodles of fun for me, but I’m a little happy it’s over so I can finally share this honey goat cheese pizza with you! It’s divine. I can’t take credit for the idea of this pizza…that goes to my dear friend Faye. Yet another reason I’m grateful Faye is in my life. Here’s why I love this pizza. 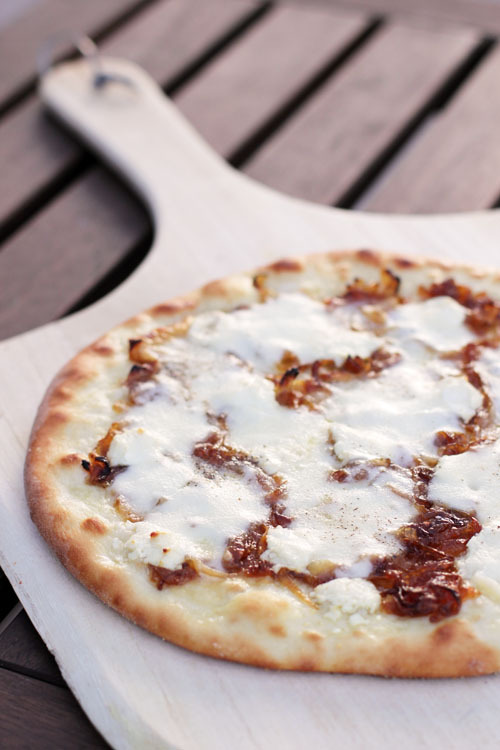 The sweetness of the goat cheese and the caramelized onions balances perfectly with the saltiness of the parmesan cheese and the salt that you sprinkle on the pizza. And the texture of the mozzarella cheese balances out the goat cheese oh so nicely. It’s perfection on a pizza crust. Make your crust. When it's ready to be topped, drizzle some olive oil on the crust and spread around with your fingers. Sprinkle salt all over the crust, and a bit of pepper. 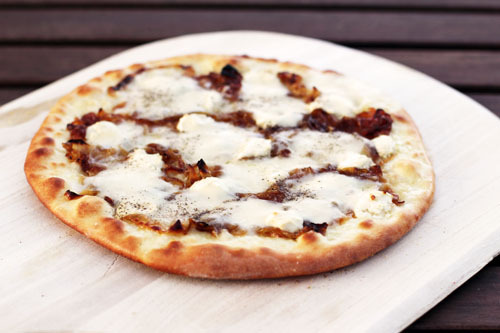 Top with the caramelized onions, mozzarella cheese and fresh parmesan cheese. 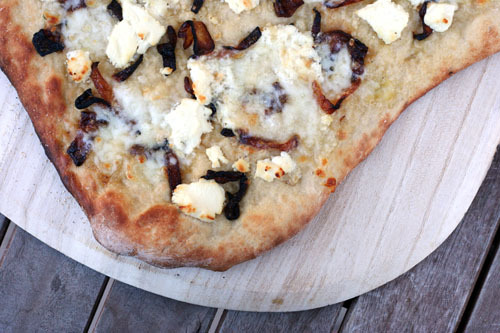 Like I mentioned in the ingredients list, if you can't get your hands on the Trader Joe's honey goat cheese - I would just drizzle a bit of honey over the pizza before topping with the cheeses and onions. 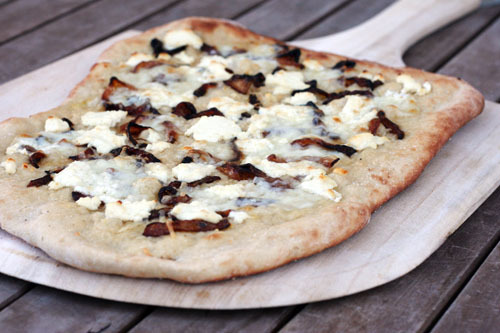 You could also mix your plain goat cheese with honey before putting dabs of the cheese on the pizza. Bake on a pizza stone at the highest heat your oven can put out until cheese is bubbly and the crust is browned (or bake your pizza how you normally bake it). I hope you all enjoyed getting a little taste of Menlo Park this week! It was very fun sharing our town with you! I made these cookies last night. After reading this tweet from Christine Koh, I couldn’t resist. I think the cookies are pretty and they taste like super flat but rich and moist brownies. 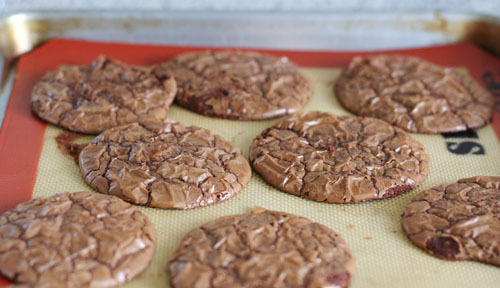 I’ve never worked with a cookie recipe like this – the dough was much more the consistency of batter and I was skeptical right up until the moment I ate them. Also, I didn’t have all the stuff to make them chunky, so I think mine came out differently than they were supposed to…but they still tasted good. It’s always fun trying new recipes! Especially with chocolate involved! Last week was great! So many of you stepped up with menus – yippee! Keep up the good work! Please share your menu, big or small! Also, if you want to share what you have already cooked, of course we love that, too! On last week’s menu post, Andrea labeled her menu “Last Week for Dinner,” which totally made me laugh – love it! Okay, so I love Back A Yard in East Menlo Park. I think it might be my favorite take-out spot in town. Nate and I can split one jerk chicken dinner and be left with full bellies and tingly, happy taste buds. Their jerk sauce is perfection. Perfect texture, flavor, heat…I can’t get enough. Back A Yard has been serving Menlo Park for about 6 years. 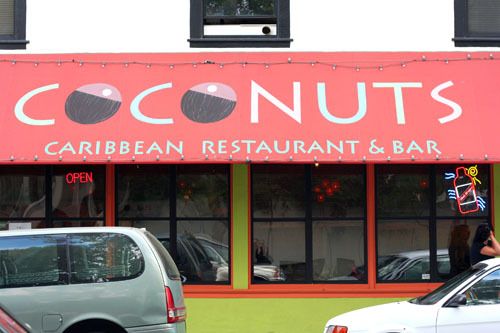 Two years ago they opened a second restaurant called Coconuts in Palo Alto, with the same wonderful Caribbean vibe and eats. I knew I had to write about Back A Yard for Menlo Park week. 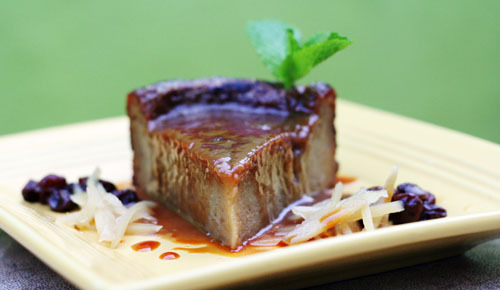 When I emailed the chef, he offered to serve us dinner at Coconuts, which of course we took him up on! I already knew the chef’s wife Annetta from my frequent visits to Back A Yard, and it was a delight to finally meet Chef Robert. We also met the other Coconuts chef Emmanuel, who took very good care of us throughout the evening. First off, we had a Jamaican soda called Ting. It rocked. My pictures of it did not rock. So, please just close your eyes and imagine what a Jamaican grapefruit soda in a pretty glass looks and tastes like. Pretty good, right? Corn Festivals. They’re kind of like donuts. But maybe better. Not so sweet, but sweet enough. I can pop ’em like candy. Seriously. It’s a good thing I only eat them every once in a while. You can also get the festivals at Back A Yard. 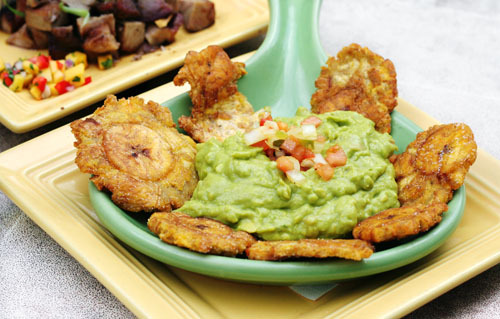 Curried Garbanzo Avocado Guacamole, with Crispy Plantain Tostones. Coconuts makes their tasty guacamole with smashed up garbanzo beans (kind of similar to the dip recipe from last week…interesting, eh?). 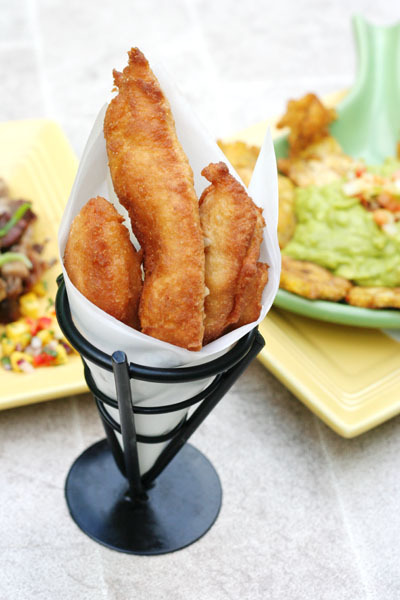 And those tostones? LOVE them. Pork bites. I love these tender little pork bites. Maybe because you get that bowl of jerk sauce. And we all know how I feel about the jerk sauce. 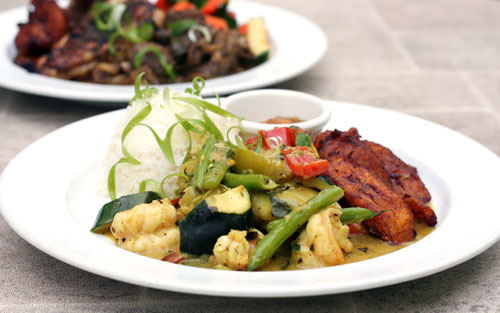 Curried shrimp. This was my dinner. It might be my favorite thing on the menu. Tons of perfectly cooked veggies. Delicious shrimp. The curry sauce is wonderful. 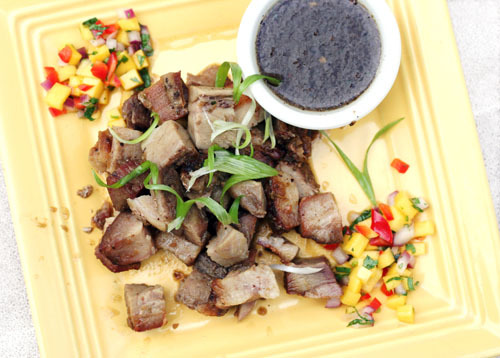 Oh, and the little cup of mango salsa complements the entire dish so nicely. 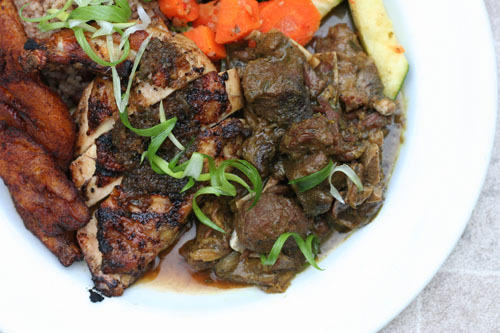 Jerk Chicken and Curried Goat. This was Nate’s dinner. There’s that yummy jerk chicken I told you about. And the curried goat is quite good – very tender with, once again, a great sauce. These people know their sauces. You can’t see it, but this dish comes with rice and beans, which you can get at both restaurants. I love me some rice and beans, and these are no exception. 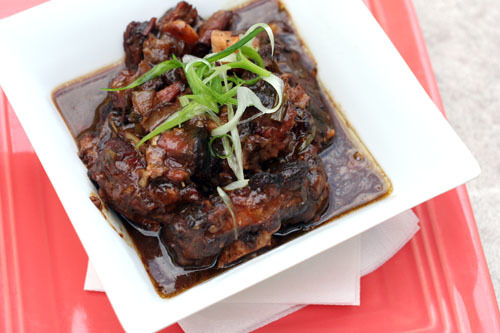 Tender Braised Oxtail. That’s right, OXtail. This meat is wicked tender. It’s also quite fatty, but seriously tasty. This is very traditional and we had to give it a try – glad we did. By this point in the meal we were STUFFED and we had enough leftovers for a whole other dinner the next night! But we had to try at least one dessert. In the name of the blog, right? Ah, the sacrifices I make. The chef recommended we go with the Sweet Potato Pudding. I told you Chef Emmanuel took care of us that night. I can’t tell you how happy I was we tried this pudding. I’m terrible at describing food…let’s see, it was warm, the sauce was yummy…see, terrible. Please just know this was good stuff. Can you see why we love these restaurants? And I should mention that I credit Back A Yard with my new found ability to eat super spicy food. Before Back A Yard, I was a wimp. But that jerk is too good to pass up. And now, my heat tolerance is high. Bring it on. Thank you to the owners and chefs for a fabulous meal! 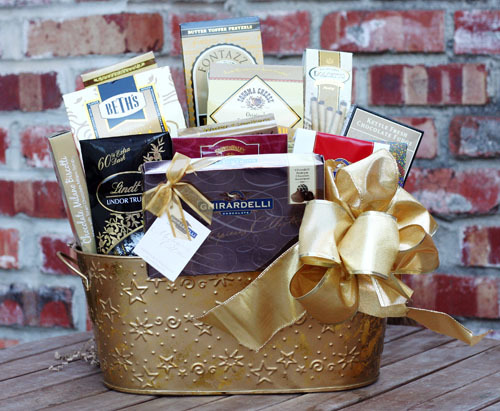 Menlo Park Week: FondTimes Gift Baskets…and a Giveaway! This giveaway is now closed. But be sure to keep reading about FondTimes…they are a fantastic resource! As I’ve prepared for Menlo Park Week, I’ve gained an even greater appreciation for small business owners. I’ve loved meeting these people who have started businesses or restaurants and work so hard to make them great. And the best part – they all love what they do. Every single local business owner that I’ve talked to the last few weeks sincerely loves their job, and the sense of pride they exhibit is inspiring. Today’s local business is no exception! Menlo Park locals Sherri and Scott Hill started FondTimes.com, a gift basket company. They’ve built the business together from the ground up and recently relaunched their website. They work hard and love what they’re doing. When Sherri talks about designing gift baskets, she literally lights up. It’s so fun to see the passion she has for their company! FondTimes.com has an amazing selection of baskets and can ship anywhere in the continental U.S. Their baskets run the gamut, from super cute for kids to very elegant for adults. When Sherri and I first talked about doing a giveaway, she told me I could pick out a basket for myself. Choosing from their large selection was a near impossible task! I finally settled on the Superstar Celebrations Gift Basket (which is on sale for $20 off, by the way). This basket is beautiful and full of lots and lots and LOTS of chocolate that has kept us happy for days now. Sherri also sent us the Halloween Boo Activity Gift Bag. Totally cute. And the silly putty? Yeah, I stole it from the kids and have it at my desk. Good luck with the giveaway! And if you ever need to send a gift basket, be sure to visit FondTimes.com and know you’re supporting a really great couple! Don’t forget, SF Bay Area and Dallas/Collin County, TX readers – if you’ve joined Juice in the City, make sure to mention that in your comment! If you win this giveaway, JITC will deposit $25 into your account to use towards deals!